Oh, wow, no! I wasn’t able to see it until I clicked on the actual post! THAT IS SO AWESOME LANA!!! Wait, did you see the picture, though? 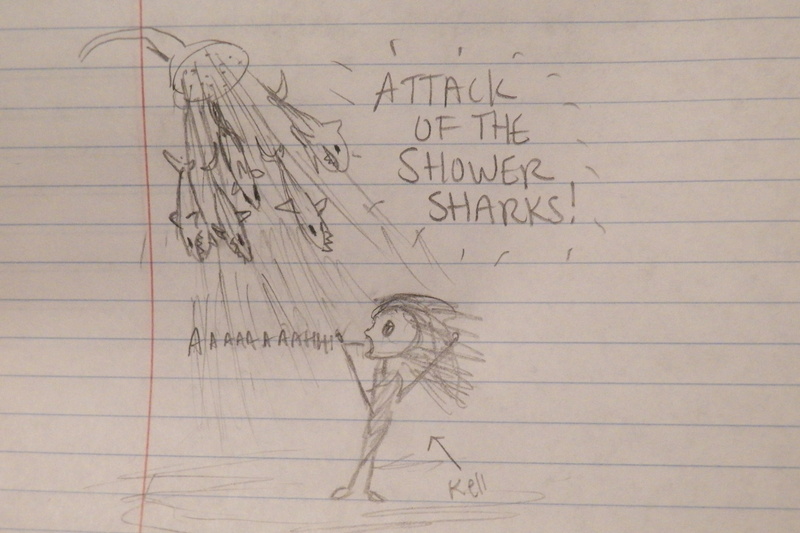 THE SHOWER SHARKS ARE ATTACKING AAAAAH!!! Shower sharks, ha! 😀 I should draw that….hehehe. If I ever remember to, yes, haha. I’m really bad at sending out email newsletters … there’s just been so much to do! You really should read them! Not many better books about animals than those… the best part is that they’re true stories! Oh my gosh. I don’t think a shark would fit in your bathtub…and if it did, you’d be able to see it! So do you still have that problem when you shower, or just when you take a bath? Hehe, alrighty. I’m pretty sure I signed up, too, but I guess we’ll find out when you send something out! Thanks! I thought they might be exciting to answer. Favorite and least favorite parts of blogging? What lessons have you learned from life? And what advice would you give to anyone about anything? Ohhh, okay! Well, German Shepherds are pretty awesome, too! I just said that German Shepherds are smarter because I have one, and she would never forgive me if I said otherwise! Ha Ha! I think I’m going to try to be longer and more me/weird (nope, not at all offended there …) in future videos. I mean, not this next one because I wanted to be all simple and basic for it … but I’ll probably ramble a little more in the one after that, haha. Ugh … I don’t know? Newsletters are hard to keep track of, man, y’know? I hardly ever send it out … I feel like you are, though? I think technically border collies are the smartest dog, haha. I think German Shepherds are the third or second smartest dog … and poodles are up there, too, believe it or not! Weird, right? Thanks for the questions! I never got it as organized as I would have liked because I got flustered because an element of the post wasn’t working. *applauds Crystal* Yes, they are adorable. And yeah, I get not wanting to snuggle with dogs … cats are just naturally cleaner, haha! Yes, you must write Beyond Her Calling Kell. Awesome, I cannot wait to read Ivy Introspective! Border Collies are adorable! I have been looking for a dog to get when I move out (many years from now) and one of them are on the list! As far as giveaway-prize-choosing-skillz (I like the ‘z’ there), I like the prizes! I…really can’t think of anything cool either, so you’re good. 😉 Oh, and yes, I am entering the giveaway! Speaking of which, I’m pretty sure I’m signed up for your newsletter already…are you able to check? How would you want to die (omitting in your sleep, of old age, etc.)? If you had to choose one of your characters to be stuck with on a deserted island for the rest of your lives, who would it be? Which three of your characters would be a unicorn, a dragon, and a sloth? If you lost your arm and had to get a prosthetic, what would it look like/include, not worrying about the restrictions of modern technology? What is your ultimate dream as a writer? I’ve known Border Collies to be one of the smartest dog breed (besides the German Shepard)! It’s amazing how Border Collies herd cattle and horses the way they do! Could you recite a whole chapter from one of your books word for word? Would you rather wear a baseball cap or a sun hat? What would you take with you if you took a trip to the moon? Excited for this tour, Kellyn! Congrats!! Can I post my review (of IvIn) on GoodReads now?? Or should I wait until I publish my post?